HOA will not be releasing a checklist of movements, modalities, and loads to practice and prepare for. We believe that if you are training regularly and participating at a box with coaches and ownership who subscribe to, encourage, and incorporate performing constantly varied, functional movements at high intensity across broad time and modal domains then you, along with the guidance of those who comprise your gym’s leadership team, are already more than well-equipped to assess your current skill level and ability. Adhere to the aforementioned training method, work hard, attack your weaknesses and you will be good to go this October 24th, 25th, and 26th. RX Division: Be prepared for anything and everything. Look at the past month of programming on CrossFit.com. If 2 out of 3 of your team’s men and women could perform at least 70% or more of the Main page WODs as RX’d, you’ll be good to compete as an RX’d team at HOA. 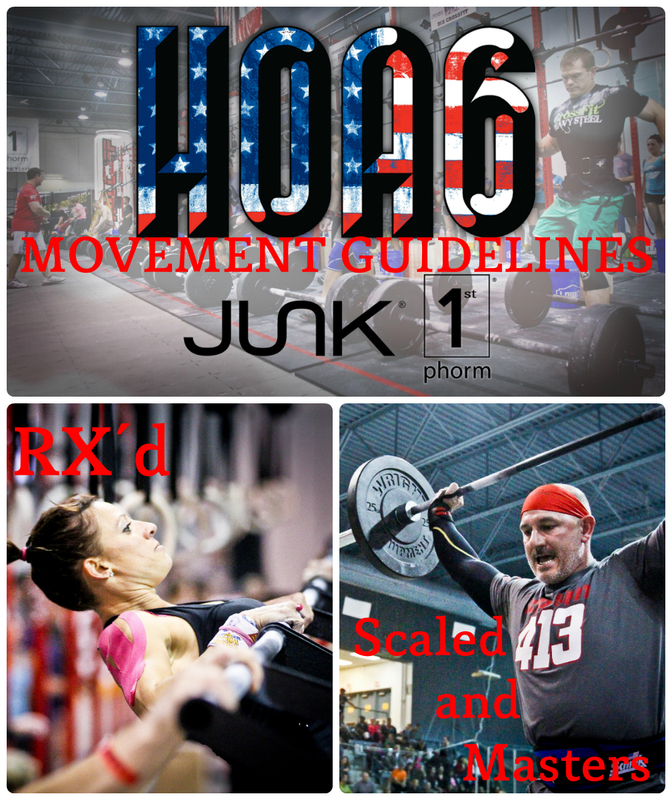 Scaled & *Masters Divisions: There will be no Muscle Ups, Handstand Push Ups, or Pistol Squats programmed at HOA6. Everything else should be considered fair game. The Scaled and Masters Division WODs will be programmed appropriately to test scaled versions of what the RX’d teams will be facing. *Anyone 40 years of age or older at the time of competition is qualified to compete in the Masters Division at HOA. There is no cumulative team age requirement as there was at HOA5. Registration for HOA6 opens on Sunday, August 10th at 5pm Central Time. The link for registration will be posted both on The HOA Facebook Page and at heartofamericacompetition.com. ← HOA6 Presented by JUNK Brands & 1st Phorm!